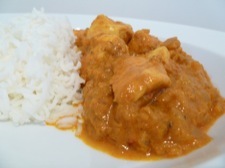 Chicken Pasanda is often overlooked for the more popular Korma, but I hope to show with this recipe that it's really worth a try. Gently flavoured with cardamon and cinnamon, a Pasanda is warming but mild and a great alternative if you find yourself choosing Korma time and time again. This is a two part recipe. In part one we make the curry paste and in part two we cook the chicken and finish everything off. Before you start have all your ingredients chopped and ready. Boil your water, put the pan on a high heat and click here! Nothing to do, just click here! Put your pan/wok on a high heat and add a knob of butter and about a tablespoon of oil. Throw in the chopped onions, garlic, ginger & chilli and stir to coat everything with the butter. Add in 1 tablespoon of turmeric, 1 teaspoon of ground cumin and 1 teaspoon of ground coriander. Stir well. Add in the cinnamon stick and 6 cardamon pods. Turn the heat down to medium and cook for 10 minutes, stirring occasionally to stop the mixture browning too much. After 10 minutes the onions should be nicely softened and the smell should be fantastic. Turn the heat back up to high and add in a tablespoon of yoghurt. Stir thoroughly until the yoghurt has been completely incorporated into the curry. Repeat this with another 4 tablespoons of yoghurt, stirring it in each time. Next add in 1 tablespoon of tomato puree and stir. Pour 400ml of recently boiled water into the pan and stir again. All that's left to do is to add the chicken but first give the pieces a pinch of salt and pepper before adding to the pan. Bring everything up to the boil and simmer for 25 minutes. 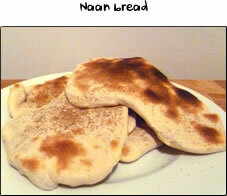 If you are serving rice or naan bread with the curry then time them to also be ready in 25 minutes. After simmering, the sauce will have reduced and thickened but you should still have plenty to dip your naan bread in, as in the photo below.